South Korean parents are fuming after a lawmaker revealed thousands of cases of financial fraud at private kindergartens during a National Assembly session on Thursday. As more and more parents call for a new oversight system to monitor the financial management of private kindergartens, the Education Ministry said only that it would cooperate with provincial authorities to make public the names of the kindergartens concerned. According to Education Ministry data revealed by Rep. Park Yong-jin of the Democratic Party of Korea, 5,951 financial irregularities occurred at 1,878 private kindergartens from 2014 to 2017. The data was gathered from inspections conducted at private kindergartens by metropolitan and provincial education offices. Accounting fraud or errors at private kindergartens amounted to 26.9 billion won ($23.8 million), the lawmaker said. There might be more cases, as not all kindergartens in Korea were inspected during that time. In one case, the principal of a private kindergarten in Gyeonggi Province was sacked in January for spending tuition fees for private purposes: buying a designer bag and paying for karaoke rooms, hotels and adult goods. The principal also appeared to have used the funds to cover automobile and apartment maintenance costs. 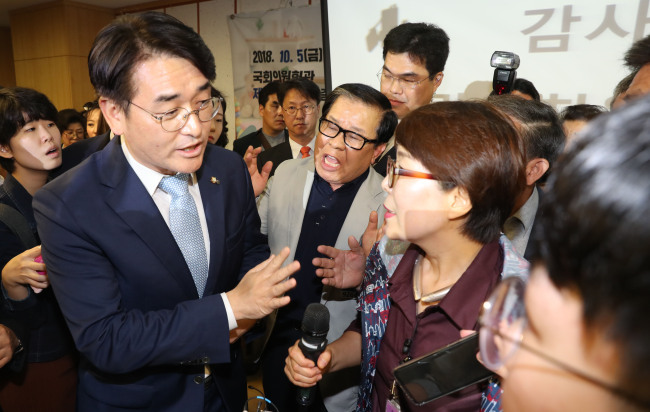 After revealing the irregularities at private kindergartens during the interpellation session at the National Assembly, Park disclosed the names of some of the private kindergartens concerned. Since Thursday, when the misconduct was widely reported, the government had received about 110 petitions with more than 4,000 signatures as of Sunday afternoon. The petitions demanded strict punishment of fraud perpetrators and a new oversight system to monitor private kindergartens. “As a person, and as the father of a household, I sincerely request a comprehensive inspection into all private kindergartens,” read one petition. According to the petitioner, he pays about 150,000 to 200,000 won per month per child, and the government provides a subsidy of about 250,000 to 350,000 won. The private kindergarten, therefore, takes in about 400,000 to 550,000 won per student. That money should not be misused for anyone’s private benefit, the petitioner added. To reduce the financial burdens borne by parents, the government offers kindergarten subsidies to help pay for tuition. One petitioner, who said her child attended one of the kindergartens involved in the scandal, complained that she had to continue to send her child there because there were no other options. “I am sending my child to one of the kindergartens that is found to have committed irregularities. And even though I now know about the wrongdoing, I cannot not send my child (elsewhere). All I can do is to listen to the principal’s excuses that it is all just a misunderstanding,” she wrote. After catching flak from parents, the Ministry of Education on Sunday said it would cooperate with the provincial education authorities to make the results of all the inspections transparent and accessible by the public. During the interpellation session, Rep. Park said private kindergartens also received state subsidies and that it was the responsibility of the government to thoroughly monitor how the money was used. Rep. Park also addressed the need to introduce a new monitoring system for private kindergartens, pointing out that inspection rates for regional education offices varied greatly. “Some regional education offices inspected more than half of the kindergartens in their respective regions in the past three years, while some offices only conducted inspections on 10 percent of the kindergartens. It is because there is no monitoring system for private kindergartens,” he said during Thursday’s session.